The Hope Democratic Party (HDP) has dragged INEC to court over the short period given to parties to campaign in preparation for the 2019 general election. The party's Presidential candidate, Ambrose Owuru, told NAN that the party also wants the court to punish INEC for allowing the APC to indirectly lobby voters with N10,000 through the “tradermoni” programme supervised by the Vice-President, Prof. Yemi Osinbajo. He said the action of Osinbajo through the scheme was ill-timed (too close to election) and should not be allowed to continue. “We want the court to declare the Federal Government’s tradermoni scheme illegal and breech of electoral act because it is a gimmick to financially induce voters ahead of the 2019 general election. 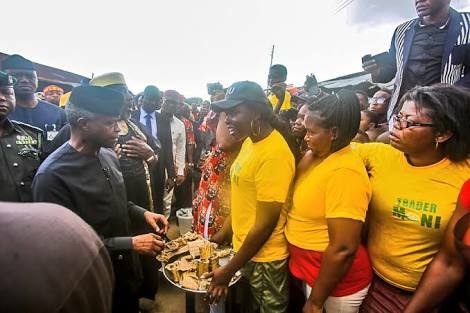 “The court should reprimand INEC for failing to check the act of Osinbajo in openly giving out physical cash of N10,000 to market women. “The court should determine whether the disguise of tradermoni during this period of election is not a plan by the APC and Osinbajo to up-stage and disrupt Hope Party’s welfarism and wealth redistribution of N2million grants to Nigerian families to end poverty. “This could be targeted at denying the party rights to equal treatment and could deny Nigerians the right to informed choices at the 2019 presidential election,” Owuru added.